Venezuela, one of the emerging capitalist countries, is economically and politically on the brink. The Government is in trouble, all the ministers have resigned and the opposition is becoming more entrenched across the country. For bourgeois analysts everything is the result of the "madness" of the socialist Maduro for continuing with the policies of the previous president Chavez, who died in March last year. In other words, they believe that the severe crisis facing the country should be put down to an insane economic policy which prioritises the welfare state and which has almost completely wiped out oil revenues, putting the country on its knees, even affecting the very recipients of state largesse and annihilating petty bourgeois businesses and traders. Their argument is that utopian "Bolivarian socialism" created incalculable damage to the national economy by chasing dreams of equality, dreams which are unsustainable for any economic reality, much less for Venezuela. All this gives credence to the double lie that the South American country really is a socialist experiment, and that any economic system that is not capitalist has no basis for existence because it denies the facts as well as all economic logic. This is not how things are. First of all Venezuela is a capitalist country with the only difference that oil, the most important sector from a financial point of view, is in the hands of the state which cannot hold up under the weight of a crisis which continues to create disasters in every international latitude of the capitalist grid. The statistical data are abundantly clear. The crisis has significantly reduced oil exports (-2% in the month of December 2013) and, consequently, the financial resources of the country. The whole economic system has immediately suffered, since oil revenue is the sole source of GDP and the prime mover of the whole national economy. The devaluation of the Bolivar, which has reached 36% against the dollar, weighs down on imports in general and food in particular, accounting for 96 % of domestic needs. The official unemployment rate has reached 8%, but the real one is well above 10%, never mind that this statistic does not include the hundreds of thousands of desperate people who somehow survive in the barrios of Caracas and Maracaibo. Inflation has reached a catastrophic 56 %, wiping out workers’ wages and salaries of those in government jobs. Over the last two years state spending has increased by 39 %. At the same time major cities have endured blackouts as the electricity supply is rationed. Meanwhile black markets have formed for everything from energy itself to consumer products, including basic necessities such as clothing, food, appliances and even toilet paper. Poverty, already endemic and never dealt with even in the fourteen years of the Chavez period, has increased at the same time as support for the regime has diminished, even within the poorest social strata, which has always been the electoral base of the presidential party. At the moment, the ship is still afloat thanks to the supply of crude oil to its Chinese ally and favourable loans (two billion dollars in 2013) from Beijing. The first consequence of this situation is that enormous critical fault lines have opened up in the ruling class. Even before the death of Chavez the Partido Socialista Unido de Venezuela (PSUV) was engaged in a power struggle between its military and civil arms. This has been exacerbated in recent months as the civilians aim to take over the positions of power currently held by the military. There are powerful vested interests which not only play on the spiritual inheritance of the deceased leader, a condition sine qua non to aspire to political power, but also the division of ministerial posts, and especially oil revenues from PDVSA (Petroleos de Venezuela SA), the largest national oil holding company and the one economic activity that handles an average annual budget of 150 billion dollars. The holding company is controlled by the military with an iron fist in the person of Rafael Ramirez, who is at the same time Minister of Petroleum and President of the national energy company. President Maduro, who comes from this military caste — like the previous president who designated him as dauphin as in all monarchical regimes — has seen fit, since he has been guaranteed the power to administer public affairs in perfect solitude for 12 months, to enact laws without going through Parliament, to reduce the powers of the Minister of Finance, of the civilian Nelson Merentes in favour of General Hebert García Plaza, from the military, and, not surprisingly, very close to Ramirez . The second is that there is a lot of government repression, which has caused a dozen deaths and hundreds of injuries. As expected, the forces of the "democratic" right, which contested the parliamentary election of Maduro down to the final vote, have taken to the streets. After them have come the fascist and golpista** right, traders and the private bourgeoisie, as well as a small fringe, estimated at only 15%, of college students. In short, the protest was organised by the desire for revenge of the entrepreneurial bourgeoisie and petty commercial bourgeoisie who feel excluded from political power, from any improved economic viability and most importantly, they feel excluded from benefitting from the oil revenue that continues to be the absolute monopoly of the government, the army and the men of the State, who are one and the same. The young university students who took to the streets are, of course, the children of the bourgeoisie. They aim to have a future "appropriate" to their aspirations, beyond any state capitalist schema which, in their eyes, is a cover for socialism. Within this framework an external element has to be inserted: American imperialism. In June 2013, in a Colombian town on the border with Venezuela, a meeting between the two “consultancy” companies directly linked to the administration of former Colombian President Alvaro Uribe, and the American FTI Consulting was held. The subject of the meeting was a "program to plan to destabilize Venezuela", taking advantage of the economic crisis and the initial demonstrations on the streets. The first approach concerned the attempt to create an artificial shortage of food. 'Specialised' teams raided tons of goods from Venezuelan supermarkets, transported them to warehouses in Colombia and then re-sold them in Venezuela at very high prices. Although the Government issued a law to clamp down on price rises, the plan was carried out anyway, and in the days immediately following the Act’s coming into force the first organised riots erupted. The second phase continues with the sabotage of some public facilities such as electricity supply, already in a mess, the transport system, especially for commuters, as well as some health centres where Cuban doctors and paramedics are present. The goal is to create havoc in society then to blame the Government as the enemy to be killed or replaced. The final weapon, the most classical, the one that American imperialism has always used in Latin America, is that of the organisation, the militarisation of fascist groups, the best known of which is the one which answers to the name of "White Hand", funded by USAID, a group linked to the CIA already operating in Venezuela since 2007. Everything inside and outside the borders of Colombia, is done with the willing agreement of Alvaro Uribe and his paramilitary structures. The former president of Colombia is involved in drug trafficking, a U.S. ally in Venezuelan affairs he still manoeuvres within his own country through his sham front man, the current President, Santos. He has made ​​an agreement with the Obama administration of a kind of pardon for his criminal activities in exchange for his logistical and paramilitary facilities in support American ambitions against Venezuela. That said, one can only agree on the need to denounce the imperialist manoeuvres of the U.S. against Venezuela, both for its role in the global strategy for the management of oil, and for launching a "reconquest" of South America starting from its compliant Colombian base. However, it should also be said that any complaint against American imperialism should not fail to mention the role of the fake socialism of the so-called Bolivarian Revolution. 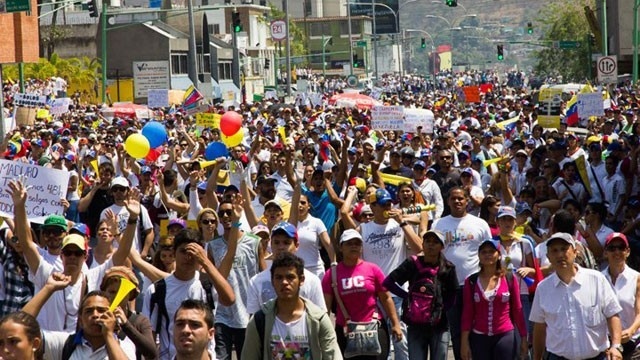 If the masses were to move, the real ones, not those manipulated by interests that do not belong to them, it should do so against the manoeuvres of the U.S. and against the government of Maduro, against its political elite – the military, which lives off the oil revenues the crumbs of which, but only the crumbs, reach the population as a tool for electoral support rather than with the real object of changing social conditions. The masses and the Venezuelan proletariat should move on the double ground of the class struggle against the imperialistic ambitions from abroad and against their own "left" bourgeoisie. To simply defend the indigenous government against external aggression would be a strategic error, compounded by the lie about the need for defence of an alleged socialist state that, in fact, does not have anything to do with socialism, where it is obvious the usual state capitalist structures exist in which the military component continues to play a crucial role. To take a step towards an effective revolutionary solution they need to create the right political conditions: a revolutionary party, a programme that does not call for the defence of their “own” bourgeoisie, because it is "left and progressive", but one which demands a change in the relations of production. Otherwise everything will remain, or almost remain, as before. i.e. as his chosen heir. Those in favour of a coup d’état (“golpe de estado” in Spanish).